Event Information: In the 2018 Senate Resolution 6 Final Report, the first line emphasizes the message of the entire document: “Fire & EMS are in a crisis – right now.” Due to lack of funding and volunteers, our emergency responders are facing challenges that make their future quite dark. The East Penn & Western Lehigh Chambers of Commerce want to support these local emergency responders, educate our business community, and connect the two groups to mutually benefit one another. 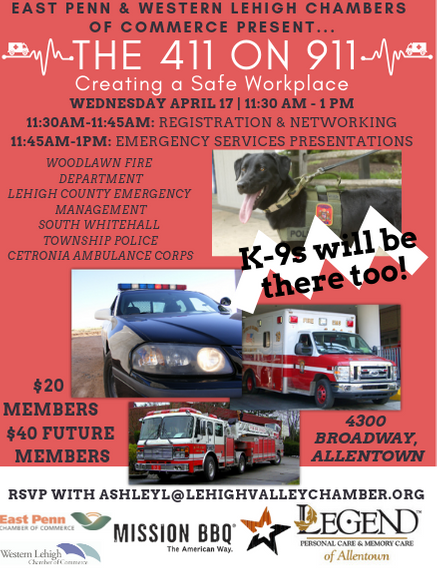 On Wednesday April 17, East Penn & Western Lehigh Chambers will facilitate an event geared to do all of those things. In addition to networking and lunch catered by Mission BBQ, emergency responders will host a formal educational program then offer ample time for attendees to walk around their set up to learn, interact, and ask questions with the volunteers or employees. Exhibitors will include Woodlawn Fire Department, Lehigh County Emergency Management, South Whitehall Township Police & K9 Unit, and Cetronia Ambulance Corps. About the Chamber: The mission of The Greater Lehigh Valley Chamber of Commerce is to improve the economy and quality of life in the Lehigh Valley Metropolitan Area. We accomplish this through business-to-business networking events and marketing products, affinity programs and exclusive, money saving member benefits, training programs, government affairs initiatives and public policy advocacy, and community development enterprises. With nearly 5,000 members who employ more than 200,000, the Chamber is the largest in Pennsylvania and New Jersey, and in the top ten nationwide.